Could you put this photo on your Wirksworth site? Ellen Malpass nee Marsden nee Wesley christened Oct 1830 died Oct 1903. Ellen married Daniel Marsden of Market Place Wirksworth Aug 1850. Daniel died May 1879 age 52 they had three children, Maria, William Wesley & Ann (who is my great grandmother). 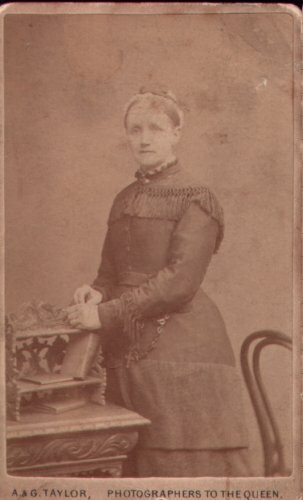 Ellen then married William Malpass a farmer in June 1888. It is said the farm was called The Poplars in Chesterfield, does anyone have any information on this? In 1901 census she is a widow and a farmer.